The Friedrichshafen G.III (factory designation FF.45) was a medium bomber was designed and manufactured by Flugzeugbau Friedrichshafen. They were used by the German Imperial Air Service (the Luftstreitkrx�fte) during World War I for tactical and limited strategic bombing operations. After the end of the war a number of Friedrichshafen bombers were converted into transport aircraft while a small number also saw service as dedicated airliners. 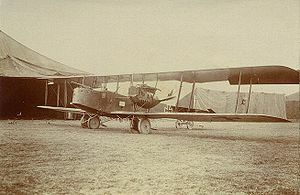 This sub-variant reintroduced a box-shaped biplane unit which improved the aircraft's control response when it was being flown on one engine. Another modification was the installation of a third 7.92 mm (.312 in) machine gun to combat British night fighters, which often attacked German bombers from below where they were hard to spot but the bomber's silhouette was easy to see against the night sky. This gun was mounted on a tubular, sliding mounting bolted to the floor of the rear gunner's position and was fired downward through a small sloping gun-tunnel cut into the bottom of the rear fuselage. By the last year of the war, the G.IIIa had replaced the G.III in production. Towards the end of the war, the G.IIIa was further modified by re-designing the rear gunner's position, which was connected to the pilot's cockpit by an open passageway. After the end of World War I, the German government and at least one commercial airline, Deutsche Luft-Reederei (DLR), operated a fleet of Friedrichshafen G.III series aircraft which were used to transport mail, high priority cargoes and the occasional passenger to and from a variety of destinations including some long distance flights to the Ukraine. For this purpose, the standard G.III series bomber, usually a G.IIIa or G.IIIb, was subjected to a set of modifications ranging from the simple disarmament to fitting a rudimentary cargo compartment in place of the rear gunner's position. Some of the aircraft operated by DLR were even more extensively modified by replacing the rear gunner's position with a fully enclosed, glazed passenger cabin. Eventually, all these operations were stopped by the Allies in accordance with the Treaty of Versailles, but until then the G.III series proved itself to be a reliable and capable transport aircraft. The Friedrichshafen G.III series was ordered in large numbers from Friedrichshafen (709 ordered), Daimler (75 ordered) and Hanseatische Flugzeug Werke (280 ordered) and most of these aircraft were delivered before the war ended. A license for the production of the Friedrichshafen G.IIIa was acquired by the Oesterreichische Flugzeugfabrik A.G. (Oeffag) for the Austro-Hungarian Luftfahrttruppe but the project was cut short before production began by the end of World War I. In front-line service with the Luftstreitkrx�fte, the G.III series equipped a large portion of the bomber force until the end of the war. The G.III series bombers served mainly on the Western Front where they were used to great effect, mostly in nocturnal attacks, on both tactical targets behind the Allied front-lines as well as for strategic air raids on major urban centers such as Paris. As far as is known no Friedrichshafen bombers of any type ever participated in strategic air raids on Britain because they lacked the range needed. The attacks on Britain were conducted exclusively by Gotha G.IV and G.V medium bombers, Zeppelin Staaken R.IV heavy bombers and Zeppelin airships. The G.III was generally well liked by its military crews for its superior load carrying capability, reliability, robustness and relatively low accident rate. These same qualities also made it popular with commercial operators during its short post-war career as transport aircraft and an airliner. Usually 2-3 x� 7.92 mm (.312 in) Parabellum MG14 machine guns. Any combination of 12.5 kg (7.5 lb), 50 kg (110 lb), 100 kg (220 lb), 300 kg (660 lb) or 1,000 kg (2,200 lb) P.u.W bombs or air-mines up to a maximum warload of 1000 kg (2,200 lb).